MSE affiliates pursue a broad range of research to capitalize on the unique position of the discipline. As a research and educational discipline, MSE has long provided advances in material products and systems made from them through an intellectual focus on determining and understanding the triangular relationship between the structure, processing and properties of materials. Materials research also demands a synergy between experiment and theory. Research in the department often combines these within an individual research group. 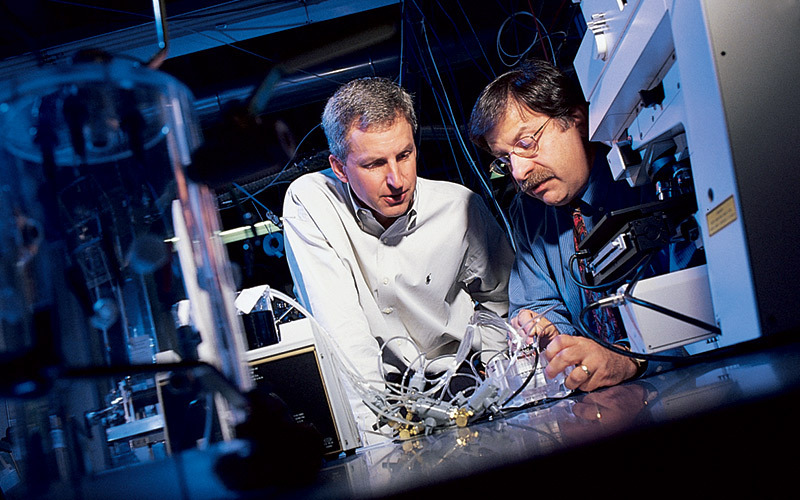 Experimental research often lies on the cutting edge, because much of the work in the department exploits state-of-art equipment and instrumentation for synthesis and analysis of materials at the nanoscale. Accompanying theoretical work is based on modeling and simulation from the atomic scale up to the macro scale, enabling more intelligent design and inference from the experiments, and solidifying and expanding our scientific and predictive knowledge base. MSE is deeply invested in nanotechnology research and initiatives, facilities, and education both on and off campus. MSE faculty are engaged in electronic and photonic projects with semiconductors. MSE faculty members and students are engaged in a variety of high-profile biomaterials-based projects, such as a battery made of wood. Researchers working in this area are focused on ceramics, composite materials and metal alloys. Faculty working in this discipline are examining ferroelectrics and magnetic oxides as well as 'smart materials,' such as sensors and actuators. Researchers working in materials synthesis are currently focused on plasma processing, combinatorial materials processing, nanotubes/nanomaterials synthesis, and electrochemical deposition. Materials characterization researchers examine several distinc topics, such as surface, interface, and thin film analysis; scanning probe micrsoscopy and novelprobe techniques; dynamic properties characterization at the nanoscale, and nanomaterials spectroscopy. Research in this area includes thermodynamic approaches, combinatorial approaches and materials informatics, process and equipment simulation, and computational design.